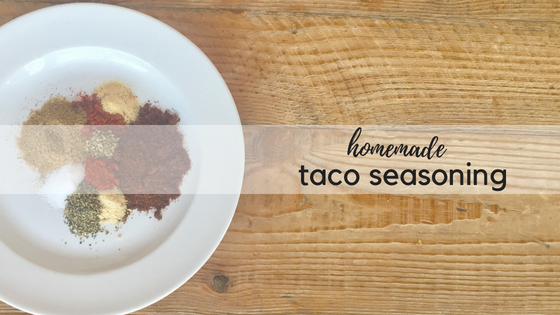 This is a great alternative to the pre-packaged taco seasoning packets. You control the spicy-ness and don’t have to worry about any mystery ingredients. The recipe below is for one meal, but I always make a 4x recipe and store it in an airtight jar….then it’s ready to go when I need it rather than making a new batch each time. Mix all ingredients together in small bowl. For tacos, brown ground beef and drain, then add spice mix to beef along with 1/4 to 1/2 cup water and simmer 5-10 minutes. Would you modify this for Chicken? When I make chicken for tacos I use my slow cooker and some salsa mixed with the taco seasoning: dump a jar of salsa in slow cooker and add about 3 tbs of taco seasoning and mix around. Add chicken and toss to coat. Cook on low 8-10 hours, on high 4-6. Shred when cooked through and tender. Very Good. I made it that way in the crockpot last week with my own salsa (and an extra jalapeno for Tony) and it was AMAZING. I rolled in bib lettuce instead of a tortilla. Was really good, Thank You! No mas seasoning packets.